Within these water-deposited sedimentary rocks are the fossilized remains of billions of plants and animals. These fossils are evidence of rapid burial since organisms that are not buried rapidly will quickly decay or be eaten by scavengers. The fossils are often found in mass graveyards, and marine and land creatures are frequently buried together.3 This is exactly what one would expect from the catastrophic global Flood described in the Bible. 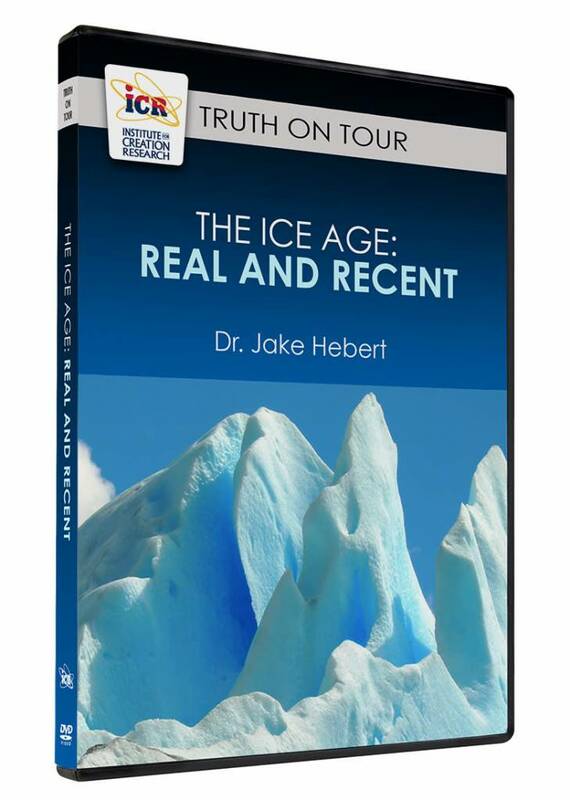 People groups all over the world have recollections of a great flood that nearly destroyed the human race. ICR President Emeritus Dr. John Morris has personally collected more than 200 such flood stories, many of which bear remarkable similarities to the Genesis account.4 If the Flood was a real event, then it would surely have been remembered by those who lived through it—Noah’s family—and told to their descendants. The Flood also enables us to make sense of clues contained within Earth’s interior. 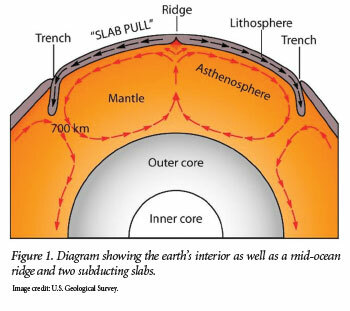 Our planet can be divided into a thin outer crust, a core at its center, and the mantle between them (Figure 1). The core is comprised of a solid inner core and a liquid outer core. The uppermost part of the mantle and the crust together comprise the lithosphere, about 60 miles thick. Like a cracked eggshell, the lithosphere is divided into seven or eight large plates and many smaller plates. When an oceanic plate and a continental plate collide, the denser rocks of the ocean floor tend to slide under the less-dense continental rocks, a process called subduction. As a subducting plate moves down through the mantle, the resulting friction heats the surrounding material. This heating reduces the viscosity of the material, enabling the subducting plate to move more quickly. As long as the heat is carried away by the surrounding mantle rocks faster than it is generated by the subducting slab, subduction will be slow and gradual. If, however, the generated heat is not carried away at a sufficient rate, the viscosity of the slab decreases still further, enabling the slab to descend even faster. This results in an effect called runaway subduction in which the subducting slab moves at speeds of meters per second rather than centimeters per year!6 Fortunately, conditions for runaway subduction are not currently present in the mantle, but there are good reasons to think such conditions occurred in the past. If runaway subduction did occur, then certain things logically follow. Since one expects Earth’s volume to remain constant during the subduction process, rapid subduction and the destruction of the old seafloor also imply rapid creation of a new seafloor. This would occur at the mid-ocean ridges, where hot magma rises upward (Figure 1). The lithosphere above the ridge would stretch and thin, allowing the magma to break through the crust. 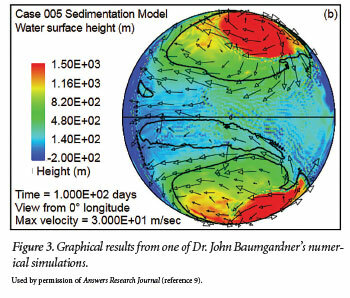 Dr. Baumgardner thinks the mid-ocean ridges, which encircle Earth like seams on a baseball, were the result. As this hot magma came into contact with cold seawater, the result would have been a long, linear geyser that ejected huge amounts of superheated water into the atmosphere. This may have been the source of the intense rains that fell for 40 days and 40 nights (Genesis 7:12). Molten lava, or magma, contains minerals whose magnetic domains tend to align with the direction of Earth’s magnetic field. When the rock cools and hardens, this alignment is “locked” into the volcanic rock. The basaltic rocks on either side of the mid-ocean ridges depict a striped pattern consisting of alternating bands of magnetization that reverse direction as one moves away from the ridge. This striped pattern indicates that Earth’s magnetic field has flipped dozens of times, with the north and south magnetic poles trading places. Accepting the Genesis Flood as literal history enables researchers to make sense of a huge array of data. 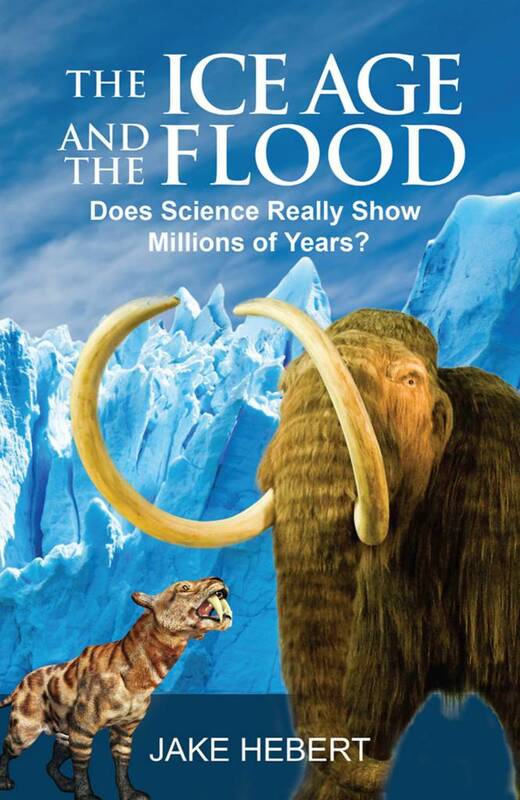 Although creation scientists are still working to resolve unanswered questions, the creation-Flood model is much more robust and has much more explanatory power than secular Earth history stories. Skeptics “willfully are ignorant of” (2 Peter 3:5) the reality of the Genesis Flood—not because of a lack of evidence but because of an unwillingness to acknowledge God’s Lordship over their lives. Years ago when I was an undergraduate, a secular geologist told me that 90 to 95% of the world’s sedimentary rocks were water-deposited. Thomas, B. 2014. Do Sand-Dune Sandstones Disprove Noah’s Flood? Acts & Facts. 43 (9): 18-19. Morris, J. D. 2001. Why Does Nearly Every Culture Have a Tradition of a Global Flood? Acts & Facts. 30 (9). Burr, C. The geophysics of God. U.S. News & World Report, June 16, 1997, 55-58. Baumgardner, J. R. 1994. Runaway Subduction as the Driving Mechanism for the Genesis Flood. In Proceedings of the Third International Conference on Creationism. R. E. Walsh, ed. Pittsburgh, PA: Creation Science Fellowship, 63-75. Baumgardner, J. R. 2003. Catastrophic Plate Tectonics: The Physics Behind the Genesis Flood. In Proceedings of the Fifth International Conference on Creationism. R. L. Ivey, Jr., ed. Pittsburgh, PA: Creation Science Fellowship, 113-126. Baumgardner, J. R. 1994. 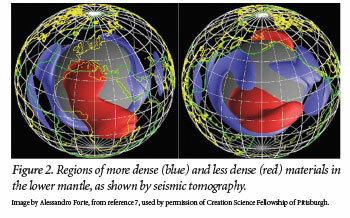 Computer Modeling of the Large-Scale Tectonics Associated with the Genesis Flood. In Proceedings of the Third International Conference on Creationism. R. E. Walsh, ed. Pittsburgh, PA: Creation Science Fellowship, 49-62. Coe, R. S., M. Prévot, and P. Camps. 1995. New evidence for extraordinarily rapid change of the geomagnetic field during a reversal. Nature. 374 (6524): 687-692. Bogue, S. W. and J. M. G. Glen. 2010. Very rapid geomagnetic field change recorded by the partial remagnetization of a lava flow. Geophysical Research Letters. 37 (21): L21308. Sagnotti, L. et al. 2014. Extremely rapid directional change during Matuyama-Brunhes geomagnetic polarity reversal. Geophysical Journal International. 199 (2): 1110-1124. Humphreys, D. R. 1990. Physical Mechanism for Reversals of the Earth’s Geomagnetic Field During the Flood. In Proceedings of the Second International Conference on Creationism. R. E. Walsh and C. L. Brooks, eds. Pittsburgh, PA: Creation Science Fellowship, 129-142. Oard, M. 2006. It’s plain to see: Flat land surfaces are strong evidence for the Genesis Flood. Creation. 28 (2): 34-37. Clarey, T. 2015. The Whopper Sand. Acts & Facts. 44 (3): 14. Hebert, J. ‘Big Science’ Celebrates Invalid Milankovitch Paper. Creation Science Update. 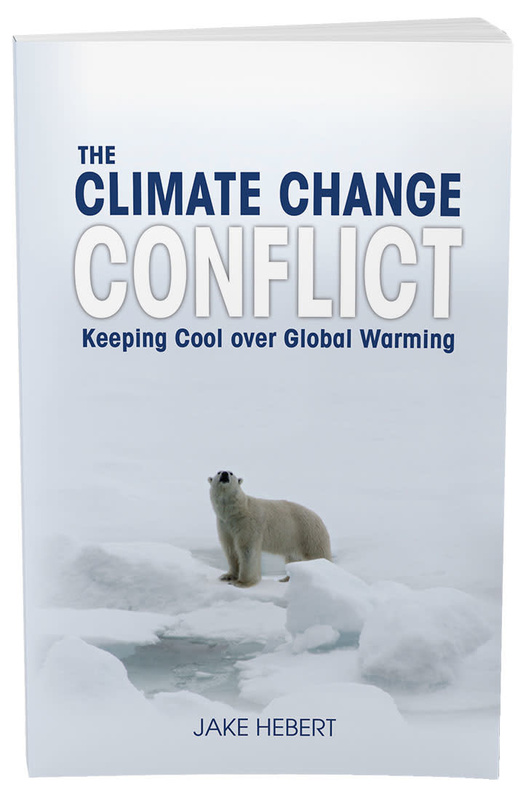 Posted on ICR.org December 26, 2016, accessed May 16, 2017. Cite this article: Jake Hebert, Ph.D. 2017. 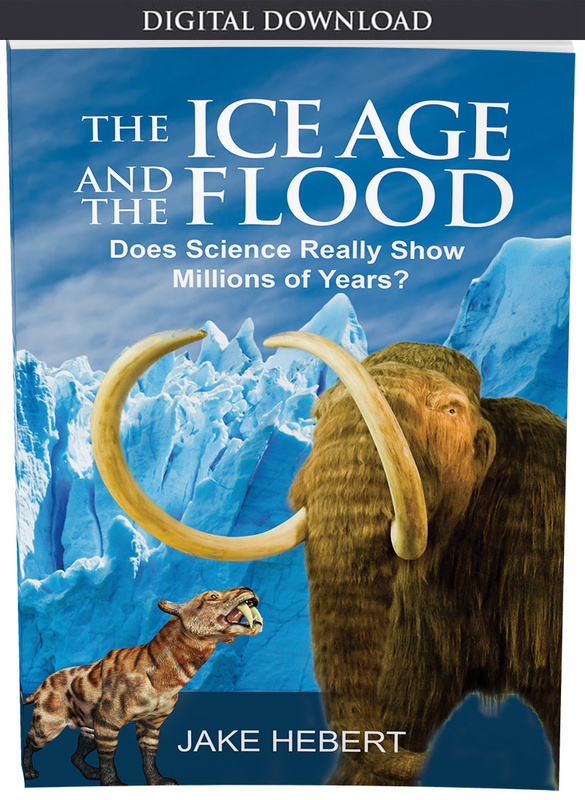 The Flood, Catastrophic Plate Tectonics, and Earth History. Acts & Facts. 46 (8).